Centro Internacional de Mejoramiento de Maiz y Trigo. Vols. for <1974-> issued by the center under its Spanish name: Centro Internacional de Mejoramiento de Maiz y Trigo. Significant changes have recently occurred in the CIMMYT leadership. We have lost the services of Dr. KeithW. Finlay, Deputy Director General- Research, and Dr. R. Glenn Anderson, Director of the Wheat Program, who each succumbed to cancer. Their contributions to CIMMYT will live on, although their leadership, experience, and dedication will be sorely missed. To help fill this void, we have recently appointed Dr. Olive James as Deputy Director General for Research. He comes to CIMMYT with strong credentials as a scientist and in research administration. CIMMYT's collaboration with agricultural scientists in over 120 developing countries continued to strengthen in 1980. New regional programs were established for North and West Africa (wheat), West Africa (maize, in collaboration with IlTA), and South and Southeast Asia (wheat). We continue to broaden our crop improvement objectives to include greater attention to those rainfed production areas characterized by greater agroclimatic stresses. Our increased emphasis on crop management research is being strengthened through the collaboration of our regional agronomists and economists in national on-farm research programs. During 1980, additional facilities were completed to accommodate visiting scientists made possible by a grant from the Government of the Federal Republic of Germany, and a new wheat germplasm facility, financed through a grant from the Government of Japan, will be operational in 1981. To help guide program priorities and activities in the 1980s, we recently completed a program review and planning exercise. Our program priorities were exposed to critical review and debate at a planning conference held at CIMMYT in April 1980. The changing comparative advantages and the tasks which must be performed during the 1980s by the many organizations concerned with agricultural development in the developing world were highlighted by many participants at the conference. and production technologies into use. CIMMYT's germplasm improvement strategy begins with the creation of gene pools classified on the basis of climatic adaptation, maturity characters, and grain type. A range of gene pools have been formed to serve tropical and subtropical zones. Most of these gene pools have reached the stage of having agronomically acceptable plant types. In recent years, therefore, we have initiated work to improve the insect and disease resistance of these materials. Added emphasis has been given to the development of early-maturity, disease-resistant germplasm with high yield potential. Several special research efforts continued to develop improved germplasm for highland tropical areas (particularly floury maize types). Our emphasis is on the development of broadly adapted, early-maturity types with greater resistance to specific diseases and insects. Research efforts to develop broad-based temperate x tropical gene pools have generated considerable enthusiasm among maize scientists in temperate areas. The three special pools we have formed to date are permitting the introduction of exotic germplasm into temperate base materials, which in turn will serve as a mechanism to move desirable genes from temperate materials into tropical germplasm. Superior germplasm from CIMMYT's different gene pools continues to be identified and transferred into corresponding advanced maize populations. CIMMYT begins to distribute the advanced populations through the international maize testing network as soon as they are considered to be of utility to scientists in national programs. These collaborators play a key role in the improvement of the populations and in the development of experimental varieties. In 1980, CIMMYT shipped 734 individual trials to collaborators in 78 countries. The data from these trials confirm the progress made in raising the yield potential, improving the insect and disease resistance, and increasing the environmental stability of CIMMYT materials. Work is being intensified on three major diseases of maize: downy mildew, streak virus, and corn stunt. Good progress has been achieved in developing high-yielding materials with resistance to downy mildew and corn stunt. CIMMYT continues to receive mounting seed requests from national collaborators for our advanced materials. In 1980, forty-two national maize programs asked CIMMYT for supplemental seed shipments with intentions to increase this seed for varietal demonstrations on farmers' fields. and/or methodologies used within central program activities. Tripsacum, are beiig pursued to determine the feasibility of using potentially valuable genes from these genera for maize improvement. The aim of this wok is to make maize a more environmentally stable crop. Several hybrics have emerged from this work. A cytologist joined the staff in 1981 to help unravel the identity of these hybrids and to help increase our u understanding about the mechanism for the production of such hybrids. Seventy trainees from 33 countries received in-service training in Mexico in 1980. Another 22 visiting and associate scientists came to Mexico on special assignments and/or for orientation to CIMMYT's maize research prcgram. In addition, CIMMYT cooperated in the training of 6 maste 's degree candidates and 5 predoctoral and postdoctoral fellows. improvement research on specific disease and insect problems. begins in what we call the "Back-Up Unit", whose staff is charged with the first stages of improvement for different types of maize. The Back-Up Unit evaluates materials from around the world, maintains CIMMYT's maize germplasm bank (the largest in the world for maize), and creates and improves gene pools classified (see table 1) on the basis of climatic adaptation, maturity characters, and grain type. Each year, superior introductions and bank accessions are systematically evaluated and added to one of 31 gene pools. At present, there are 12 gene pools for tropical-lowland zones, 8 for the subtropical-temperate zones, 7 for tropical highland zones, and 4 special pools for temperate regions. Superior germplasm in these pools is identified and transferred to CIMMYT's corresponding advanced maize populations, which are regularly distributed to national collaborators through the international maize testing program. * Mean of main growing season. breeding requirements and as a service to national collaborators. Each year, our staff evaluates a portion of the bank collections, and also regenerates different collections of maize (and rela-:ed species) that are held in the bank. from scientists in :28 countries. were then added 1o the appropriate gene pools. constitute the next improvement cycle of each pool. pools in Mexico to broaden their adaptation. Improving the pest resistance of the CIMMYT gene pools is an important research objective. Here, a maize pathologist is reviewing pool materials to select resistant plants to upgrade the overall disease resistance in the CIMMYT pools. Most of CIMMYT's maize gene pools have reached the stage of having agronomically acceptable plant types. In recent years, therefore, we have initiated work to improve the insect and disease resistance of these materials. Different pools are artificially inoculated with disease-causing organisms or are artificially infested with insect larvae according to the principal disease and insect problems (e.g., earworm, fall armyworm, borers, ear rot, stalk rot, leaf blight, rust, etc.) in areas where each pool is meant to serve. In 1980, several pools were tested to determine the progress achieved in developing greater disease and/or insect resistance. Greater resistance to certain insect and disease problems was evident in the latest cycles of selection in some pools compared to the original pool materials. CIMMYT has had a considerable amount of high-yielding germplasm in the intermediate and late maturity ranges. tropical areas, CIMMYT's highland pools were reorganized in 1979. Particu ar emphasis was placed on the improvement of floury-type materials, the dominant maize types in the highland areas cf the Andean countries of South America. temperate x tropical gene pools with the objective of broadening the genetic base of both types of materials. Three pools were form,. !d according to their adaptation to (1) the northern temperate climatic ranges, (2) intermediate belts of temperate regiors, and (3) the southern temperate belts. (Similar ranges i i the southern hemisphere correspond to the northern hemisphere, but in reverse order.) These pools are permitting CIMMYT scientists to introduce exotic germplasm into temperate base materials, which in turn would serve as a mechanism to move genes from the temperate region materials irto tropical lowland and highland germplasm. broadening the ge'ietic base of both germplasm groups. national collaborators for use in their breeding programs. Many of these early-generation materials are proving to be extremely useful to national scientists as they seek to develop higher-yielding varieties with good agronomic characters. This policy of germplasm sharing can accelerate the improvement efforts in national maize programs with higher levels of scientific manpower and adequate financial resources for research. Within the total maize improvement process, CIMMYT has assigned responsibility to its "Advanced Unit" to refine more advanced maize materials to a point where they are ready for systematic international testing and use by most national programs. In 1980, the Advanced Unit team worked on 26 different populations. These populations have been assembled on the basis of climatic adaptation (tropical, subtropical, temperate), maturity period (early, intermediate, late), grain color (white, yellow), and kernel type (flint, dent). Variable relative weights are given to different traits for improvement in each population according to the geographic areas the population is meant to serve. In one population, greater disease and/or insect resistance may receive the highest improvement priority. In another, the objective may be to improve the manageability (shorter height, better standability). In another, added earliness may be the major objective. Each population undergoes continuous selection using within- and among-family variation. Advanced Unit populations are grown and improved for three generations in Mexico; in the fourth generation (or once every two years) they are tested in international trials at 3 to 6 sites, worldwide. Whereas the gene pools in the Back-Up Unit are selected mainly on the basis of visual observations at growing sites in Mexico, the Advanced Unit populations are improved on the basis of their performance in replicated yield trials in the agroclimatic conditions where the population will be used. CIMMYT continues to improve certain populations for disease and insect resistance in the manner described earlier. For disease resistance, populations grown in Mexico are artificially inoculated with stalk- and ear-rotting organisms. damage are retained for future recombinations. were organized )etween CIMMYT and six national maize programs to develop germplasm resistant to three major diseases of maize in tropical areas. These diseases are: downy mildew, caused by a fungusfound mainly in South and Southeast Asia, but now spreading to Africa and Latin America; maize streak viru:;, disseminated by a leaf hopper throughout tropical Africa; aid corn stunt, a disease also spread by a leaf hopper in tropical Latin America. In this research CIMMYT and its collabora. :ors followed a "shuttle breeding" strategy. material with resistance to downy mildew and to corn stunt. The progress on streak virus had not been as successful, due to the lack of an insect-rearing facility (streak virus is disseminated by a leaf hopper) located in virus-affected areas of Africa for uniform inoculation and disease screening. CIMMYT has now shifted its center of activities in these disease research projects to regional programs located in affected areas. The work on downy mildew resistance, including the preparation and distribution of international nurseries, is now centered in Thailand with full involvement of Thai and Asian region scientists. We have shifted our international breeding program for streak virus resistance to Nigeria, with full involvement of IITA and West African scientists. The international breeding work for corn stunt remains as a collaborative research effort between CIMMYT, Mexico, and two Central American countries, Nicaragua and El Salvador. International testing plays a major role in identifying and developing improved materials for the areas where they are meant to serve. C IMMYT begins to distribute populations through the international testing program as soon as they are considered to be sufficiently advanced to be of utility to scientists in national programs. This international testing program is designed to: (1 ) serve national programs that are at different levels of development, and (2) to combine into one mechanism a system for continuous improvement of maize germplasm as well as a delivery system to and from national programs. A key feature in this system is the partnership role that national program scientists play in the improvement of populations and the development of experimental varieties. In 1980, CIMMYT shipped 734 individual trials to collaborators in 78 countries. These trials included 67 progeny trials, 394 experimental variety trials, and 273 elite experimental variety trials. Most of the data from the results of 1980 international trials are still to arrive. Therefore, the report which follows is based upon the 1979 international testing program, since the final reports are available on these trials. National collaborators play a full partnership role in the international maize testing program. CIMMYT's in-service maize breeding trainees, as part of their program, receive a complete orientation to the research methodologies in population improvement and varietal development followed by CIMMYT. Thirteen Advanced Unit populations entered into International Progeny Testing Trials in 1979. These international progeny trials serve two purposes. First, About ten of the best progenies are identified at each testing site by a national collaborator. These outstanding progenies are used to form an experimental variety. Second, 30 to 40 percent of the best performing progenies across all sites are selected to regenerate the next cycle of the population. The 1979 IPTT results (and special requests by national collaborators) provided the basis to develop 61 location-specif ic and 11 across-location experimental varieties. Some were tested during 1980 and others will be tested in 1982. Included in these trials were three quality protein maize populations. In general, the progenies selected for future experimental variety (EV) development had earlier maturity and shorter plant height than the topyielding national check varieties included in each IPTT trial. In 1979, four different EVTs were assembled, and 244 sets were distributed to national collaborators upon request. One quality protein maize trial, consisting of seven quality protein maize (QPM) experimental varieties (EVT15A), also was included. Some of the best-performing EVs are compared in table 2 to the best checks at individual sites where the particular trial was grown. The best-performing experimental varieties across all internationa! testing locations during 1977 and 1978 were selected to form subsequent elite variety trials in 1979. Three ELVTs were assembled and 233 sets were requested by national collaborators. One quality protein maize trial (ELVT19) was included, consisting of six QPM elite experimental varieties and one QPM population. These QPM materials were evaluated against national normal and QPM check varieties. The tentative distribution of international trials in 1981 includes 546 individual trials requested by collaborators in 92 countries. This testing network now involves virtually all developing countries which produce maize. (F2) experimental varieties instead of first generation materials (Fl). This means that only IPTTs and ELVTs will be distributed in 1981. From 1982 onward EVTs will continue to be distributed as in the past on a request basis. Beginning in 1970, CIMMYT's maize improvement program was expanded to include work on the nutritional quality aspects of maize. Today, this work is an integral part of the total maize improvement program. Various materials undergoing improvement in the Back-Up and Advanced Units have parallel quality protein maize (QPM) counterparts. Following the discovery of the effects of the opaque-2 gene in improving the nutritional qualities of maize (enhanced levels of the amino acids lysine and tryptophan), considerable enthusiasm developed among scientists that opaque-2 maize could make a major nutritional impact in food-deficit, low-income countries. Farmers and consumers in the developing world did not react to opaque-2 maize with the same enthusiasm due to several adverse effects associated with the opaque-2 gene. The major defects of opaque-2 maize were kernels with a soft chalky appearance, lower-yielding ability (compared to normal maize), greater vulnerability to ear rots and stored-grain pests, and a higher moisture content in the grain at harvest. China is the largest maize producer in the developing world. This Chinese visiting scientist spent 4 months at CIMMYT in 1980. Here he reviews quality protein maize materials which offer potentially exciting prospects for the Chinese people. oping world. Once proven, QPM materials are then promoted to the international testing program, starting first as IPTTs. Table 3 reports selected data on the performance of the best QPVI materials in comparison to the performance of the best checks in some of the 45 countries where the QMPT-11A and 11B were tested in 1979.
that they can be commercially exploited during the 1980s. some QPM materials. The objective of this research is to further improve t )e nutritional value of quality protein maize through increasing the energy concentration in the grain without affecting other grain traits. We also are looking at genetic ways to protect QPM materials from pollen contamination from norr-ral materials. further, given the results already obtained. objective, such as shortening the plant and reducing leaf area and tassel size. This work has proven to be extremely successful and appears to offer opportunities to make major impacts upon the yield efficiency of tropical maize. CIMMYT scientists, using the lowland tropical maize population Tuxpehio, have been recurrently selecting for shorter plant height within successive cycles of this population. In 1980, 20 cycles of selection had been completed, and plant height had been reduced to approximately 50 percent of that of the original material. The ratio between grain and stover in the total plant dry matter of the later selection cycles is now 50:50 compared to 35:65 in the original population. That is, half the plant's total dry matter is now partitioned to grain, a ratio similar to the high-yielding maize types grown in the U.S. Corn Belt. As the plant has become shorter, it has also become earl ier-to-maturity when compared to the original material. While the more efficient short-plant --ype is clearly advantageous, the realization of maximum yield potential implies a higher plant density requirement with increased seed and more work in planting where hand labor is used. Therefore, such plant types will need a different agronomy. Yield increases are attributed to less lodging in the shorter plants, fewer barren plants, and to improved partitioning towards more grain without reducing the total dry matter produced per unit of area. With the advantages of increasing yield efficiency through reducing plant height now demonstrated, the project is coming to a conclusion. Final evaluation studies were under way in 1980-8 1 on CIMMYT experiment stations. A graduate student from the University of Minnesota was also evaluating different cycles of selection in on-farm trials carried out in conjunction with CIMMYT's production training program in the lowlands of Veracruz State, Mexico. CIMMYT ha; experienced a growing demand from national programs or earlier-maturing materials to fit into a brief rainy seaso) or more intensive cropping sequences. evaluate the first eight cycles of selection. A preliminary observation is that as you select for earliness you tend to get shorter, more manageable plant types. A number of earlymaturing families from this special project have been used to help form two Advanced Unit populations (30 and 31) for areas requiring early maturity varieties. A previous PhD thesis research project is being continued by CIMMYT scientists to look at the effects of altering the length of pre- and post-flowering growth phases upon subsequent maturity characteristics. In 1980 CIMMYT scientists in the Special Projects Unit made their 13th cycle of recombination in a maize population drawn from many temperate and tropical climates. Initially, the cold climate materials would not set seed in the lowland tropics, and vice versa, because of sensitivity to differing daylengths, temperatures, and diseases. These problems were overcome and the population can now set seed in a range of maize-growing environments. CIMMYT's interest in crossing temperate and tropical germplasm has expanded, and this work has now been shifted to the Back-Up Unit. Combining Ability of CIMMYT Germplasm In 1979 and 1980, CIMMYT carried out yield trials on its experiment stations in Mexico on the combining ability of its germplasm to provide information to collaborators interested in using CIMMYT materials to develop hybrids. All CIMMYT pools and populations were crossed to Eto Blanco and Tuxpeho P.B., two varieties that are known to combine well. A number of good combiners were identified. hybrids and to understand more fully the mechanism for their production. environmentally stable crop with better insect and disease resistance (from Tripsacum) and more drought and waterlogging tolerance (from sorghum). more maize-like in appearance and are annual. In maize x sorghum crosses only non-classical hybrids have been retrieved. early 1981 to help unravel the identity of these hybrids. Mexico to do thesis research. -Postdoctoral fellows: 2 years service at CIMMYT. -Visiting and Associate scientists: up to 1 -year fellowships at CIMMYT. The in-service training program is now ten years old. Over 550 trainees from 58 countries have passed through the six-months course. About 7 out of 10 trainees specialize in production agronomy. In 1980, 70 trainees from 33 countries participated ir one of the four in-service training programs. Of these, 48 participated in the production agronomy course, 12 in the maize improvement course, 5 in experiment station management, and 3 in the protein quality laboratory training. The production training program emphasizes on-farm research. In addition to long hours of field work associated with on-farm surveys and experiments, the trainees are introduced to the integrated research strategies needed in a dynamic national maize production program. In the maize improvement course, trainees are introduced to the range of breeding materials handled by CIMMYT in Mexico at our different experiment stations. Emphasis is given to the field research skills needed to design and manage a maize improvement program. This practical training is interspersed with participation in the agronomy experiments conducted by the production trainees on farmers' fields, and with classwork related to the breeding methodologies used by CIMMYT scientists. and USA) are serving on the Maize Program staff. During 1980, the Maize Program received 22 visiting and associate scientists, who spent up to one year in Mexico. 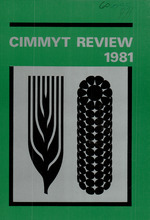 In 1980, CIMMYT also received many short-term visitors, often agricultural policy-makers and research administrators, who generally spent less than one week at CIMMYT. In 1980, scientists from most maize-growing countries of the world cooperated with CIMMYT scientists in germplasm development and exchange of research information. In a few collaborating countries CIMMYT has received special funds to assign staff members to work within a national program, usually during its more formative stages. A number of regional programs have also emerged among various maizegrowing countries and CIMMYT has posted staff to support these regional efforts. CIMMYT staff were working within four national programs at the end of 1980. These staff work on a daily basis with national program scientists in all aspects of maize improvement and production research and in training and staff development activities. One staff member assigned to the national maize program in Guatemala shifted in 1980 to a regional assignment for Central America and the Caribbean, although he still is based in Guatemala and works closely with the national program. A special report on the national maize research and production system followed in Guatemala is being prepared by CIMMYT for publication in mid 1981.
close collaboration with Guatemalan maize researchers. A regional program helps to forge stronger links among national collaborators and with CIMMYT. Regional programs generally comprise neighboring countries in which maize is a major crop (or has the potential of being one), grown under similar conditions, and exposed to similar diseases and insects. Therefore, these countries benefit from closer collaborative research, training, and information activities. The efforts of the maize staff assigned to this region are aimed at strengthening national maize improvement and production research programs. In 1980, regional staff assisted in the conducting of the international maize trials distributed to area countries. They also assisted in the assembly, distribution, and data evaluation of the PCCMCA (Programa Cooperativo Centroamericano para el Mejoramiento de Cultivos Alimenticios) trials distributed throughout the region. In maize improvement, particular emphasis was placed on greater corn stunt resistance, adaptation to conditions of drought stress, improved husk cover and reduced ear rots, and on the development of earlier varieties. National programs in Costa Rica, Guatemala, Honduras, Nicaragua, and Panama released varieties and/or hybrids in 1980 which carried CIMMYT-distributed germplasm in their parentage. On-farm research continued to receive a major program focus, with weed control and minimum tillage methods given major emphasis. The staff also assisted INCAP (Instituto de Nutrici6n de Centroam~rica y Panama) by providing sufficient quantities of quality protein maize materials to conduct an extensive research project on the human nutritional qualities of these materials. made to most of 1 he 13 countries in the region. CIMMYT's downy mildew international breeding program will now be managed by this staff member. Activities will include disease screening and selection of resistant materials for intErnational testing. Added emphasis is also being given to the; development of earlier-maturity varieties. market demand fcr maize within the region. Many collaborators have adopted CIMMYT's methodology for maize improvement. Shown above are Ecuadorian researchers who have completed 5 cycles of selection and recombination with the material, Tuxpeho P.B., using CIMMYT's modified half-sib breeding system. A number of improved tropical maize varieties have now been developed by national program scientists using germplasm extracted from CIMMYT's international testing program. In total, nine high-yielding varieties were released in the region in 1979-80, and several more are slated for release in 1981. On-farm research collaboration is receiving considerable attention by the CIMMYT regional agronomist. In particular, he has been active in assisting the national programs of Peru and Colombia in planning and implementing on-farm production research programs. In addition to helping to identify candidates from national programs to attend in-service training courses in breeding and production at CIMMYT's headquarters, the regional staff has provided assistance in several maize training courses held in Colombia. CIMMYT's regional staff also assisted in the organization of the IX Andean Region Maize Workshop, held in 1980 in Maracay, Venezuela. Forty-five research paper were presented at the workshop, attended by most of the maize scientists working in the Andean region. with resistance to stalk-rot, leaf blight and stem borers. In Egypt, after on-farm evaluations, a high-yielding, late-wilt resistant variety named Composite-2 (EV-2) was released. Nucleus and foundation seed were increased and a production pa:-kage was introduced through a pilot research/extension (ffort. In 1980, CIMMYT posted a maize scientist to Nigeria as part of a cooperative regional effort with I ITA and West African national :)rograms. With this posting, CIMMYT has shifted its international breeding program for streak virus resistance to this rE'gional base, with full involvement of I ITA and West Africar maize scientists. Considerable priority is given to this research since streak virus is one of the most serious disease prcblems in Sub-Saharan tropical maize areas. In February 1981, the agricultural scientific community lost one of its most dedicated and able members, Dr.R.Glenn Anderson, CIMPvYT's Wheat Program Director. His work has made a decisive difference in the welfare of millions of rural and urban poor in the developing world. His passing will be sorely missed jt CIMMYT and within the international network of wheat scientists he was so instrumental in forming. world food production during the 1980s. In the pages that follow, highlights of the 1980 activities of the CIMMYT Wheat Program staff are reported. More detailed descripticns of these activities can be found in our technical annual reports and various technical bulletins published each year. The central objective of the bread wheat program is to develop widely adapted, management-responsive varieties with stable disease resistance. Breeding work continues on spring x winter crosses,enhanced aluminum toxicity resistance in certain lines, development of earlier high-yielding materials, and wheats for the coolest production season of the sub-tropics. Our breeding emphasis also continued to broaden toward the problems of rainfed agriculture. CIMMYT has advanced durum lines with yield potential similar to the best bread wheats. Some research efforts are continuing to push yield potential higher, although the primary emphasis is on increasing the disease resistance and yield dependability of CIMMYT's durum materials. Triticale program objectives are to improve yield potential and agronomic type, to broaden adaptation, to improve grain test weights and bread-making quality, and to improve and/or maintain disease resistance. In 1980, the global area under commercial triticale production surpassed 1 million hectares for the first time. CIMMYT works to improve barley as a human food. Our initial breeding work concentrated on the development of germplasm with high yield potential, wide adaptation, high nutritional quality, lodging resistance, and hull-less grain. Substantial progress has been made in all these research areas. Major emphasis is now being given to the development of greater disease resistance in the CIMMYT material. Some potentially valuable germplasm carries negative attributes intermixed with desirable characters and is not readily usable in the conventional breeding programs. Special breeding efforts are undertaken to eliminate undersirable traits so that these materials can be reintroduced into the conventional breeding programs. quality and for specific disease resistance. the prevailing races :f rust for possible mutations. and certain consultation and training support functions. soil stress problems iave also been added. training of 10 maste 's degree candidates. The total area in the developing world seeded to hundreds of high-yielding varieties (HYVs) that carry CIMMYT germplasm in their pedigrees now exceeds 35 million hectares. Spectacular rates in HYV adoption continue to be registered. Perhaps the most impressive recent production impact has been in Bangladesh, which has raised national production from 114,000 tons in 1975 to over 1.2 million tons in 1981. The central objective of the CIMMYT bread wheat program continues to be the development of widely adapted, management-responsive, disease-resistant germplasm for worldwide distribution. Breeding emphasis has broadened over the years from an original emphasis on the development of semidwarf plant types with good rust resistance, towards the problems of rainfed wheat production, as well as a host of other disease and stress problems. Due to CIMMYT's global involvement, the bread wheat program must confront the numerous problems associated with environmental variability. Consequently, a wide genetic base is maintained for characters such as yield, wide adaptation, industrial quality, and disease resistance. Sucessful development of germplasm to fit these diverse environments is a product of a well-planned crossing program, adequate selection, and a large worldwide network of collaborating scientists who participate in the international testing program. We again acknowledge the continuing cooperation we receive from Mexico's Centro de Investigaciones Agricolas del Noroeste (CIANO), Ciudad Obregon, and from the scientists and other regional dependencies of Mexico's National Intitute for Agricultural Research (INIA). Their facilities and interested support play an important role in CIMMYT's breeding efforts. will soon be released as commercial varieties. good agronomic type, and superior industrial quality. .production impacts in South America, Africa, and parts of Asia. With more broad-based disease resistance and greater tolerance to agroclimatic stresses, these countries can achieve major new expansions in national production through the introduction of improved (and appropriate) germplasm and proper agronomic practices. CIMMYT is working in cooperation with Oregon State University (OSU) to transfer useful genes between spring and winter wheats. Through this crossing program, spring x winter lines are emerging which possess higher yield potential and greater environmental stability than straight spring x spring varieties. For the last two years in the international nurseries, spring x winter selections have posted the top yield performance accross all testing locations (see tables 4 and 5). These selections also appear to possess better resistance to Septoria tritici and stripe rust, as well as better drought tolerance. 1980 in Cd. Obregon, Sonora, Mexico. is losing its resistance to leaf rust and must be replaced. varieties in their rspective crops. by septoria, fusarium and other foliar pathogens. semidwarf plant type into materials with tolerance to aluminum toxicity. Promising breeding materials are shuttled in each successive generation between Brazil and Mexico as part of the improvement program. In 1980, a new laboratory facility was added at El Batan to permit rapid preliminary screening for aluminum toxicity tolerance in relatively large amounts of breeding material. By the end of the 1980 season, 46 crosses with a variable number of sister selections per cross had been identified which had the sought-after combinations of good plant type, rust and septoria resistance, and aluminum toxicity tolerance. A criticism frequently voiced in the early 1970s was that CIMMYT germplasm lacked sufficient resistance to Septoria tritici, which regularly reaches epiphytotic proportions in the rainfed regions of North Africa and Argentina. Soon after its inception, CIMMYT became involved in testing for septoria resistance in cooperation with scientists from affected areas. This collaboration has served to identify a large number of lines with excellent septoria resistance. Breeding for septoria ressistance is being turther strengthened through the distribution of larger amounts of promising materials to areas where septoria is frequently a serious disease problem. Stem rust resistance in CIMMYT bread wheats was stabilized in the late 1950s and has been retained. The opposite phenomenon ha, occurred with resistance to leaf rust. Resistant varieties at the time of release usually become susceptible after 2 to 3 years of commercial production. We have, however, observed an interesting characteristic in the varieties Torim 73 and Pzvon 76. Although each has become susceptible to leaf rust within 2 to 3 years after release, the intensity of infection has continued at relatively low levels. This type of host-parasite interaction is known as "slow rusting". In 1980, collaborators in five countries reported the release of seven new bread wheat varieties which carried CIMMYT-distributed germplasm in their pedigrees. Worldwide, durum wheat is grown on about 30 million hectares, usually under rainfed conditions and with low average yield. The most important production areas are found in the Mediterranean region, the Mideast, India, Argentina, Chile, USSR, Canada, and the USA. Durum is used in making pasta products and in making certain types of unleavened bread products. CIMMYT has advanced durum lines that now frequently yield above 8 t/ha in northwest Mexico. Results of recent international trials, 10th IDYN (1978-79) and 11th IDYN (1979-80), showed stable average yields across all locations of 4,137 kg/ha, 4,019 kg/ha, 4,634 kg/ha, and 4,545 kg/ha, respectively, for Yavaros "S", Cormorant "S", Bittern "S", and Mallard "S". Some research efforts are continuing to push yield potential higher, although most of our scientists' work is on increasing the disease resistance and yield dependability of CIMMYT's durum materials. Progress in developing durums with good stripe rust resistance has been quite successful. More resistance is needed, however, for leaf rust, and much more for stem rust. Recent data from international testing indicate that progress is being made for resistance to leaf rust and stem rust. Worldwide, durum wheat is grown on about 30 million hectares. Experimental yields of CIMMYT's advanced lines are now at a par with our best bread wheats. dependability of CIMMYT's durum lines. Work continues to incorporate added cold tolerance into durums, mainly using cold-resistant durum materials from Turkey. Materials from various sources and origins are also searched every growing season for earliness and fast maturity. straw strength in all materials. Leaf area, leaf position, and canopy continue to receive research attention to permit better utilization of light and water, and possibly reduced incidence of certain diseases. been made in developing long-lax and semi-lax heads with greater spacing between spikelets, traits which reduce the incidence of these disease problems. Although about half of the world's durum wheat production is used for home consumption, a number of developing countries are in a position to produce durums for export to Europe and other regions. To be readily marketable, these durum wheats must have a high grain test weight, large size grains, and good macaroni color. CIMMYT's cereal quality laboratory staff routinely screens new high-yielding lines to help identify parents which do not lose quality characters during macaroni processing. Today, the carotene content in many CIMMYT lines compares favorably with the best American macaroni durums. In 1980, CIMMYT distributed seven OiigieI,1L aurum nurseries to collaborators in 94 countries. During 1980, collaborators in eight countries reported the release of 13 new varieties which carried CIMMYTdistributed germplasm in their parentage. CIMMYT continues its research on the man-made crop triticale-a cross of wheat and rye. Interest in triticale as a crop continues to grow. The area under commercial production is now abou: one million hectares. Most triticale production is in the developed world, with the USSR being the largest single pro:Jucer. CIMMYT considers that it is logical for developed ccuntries to be the first to enter into commercial production, since they are better able to carry out the adaptive research needed to get triticale into use. Nevertheless, such countries as Argentina, Brazil, Chile, India, Kenya, and Tanz.ania are becoming increasingly involved in triticale research End in promoting more national production. and/or maintain d sease resistance. than wheat, a repartitioning to grain may push maximum yield potential to higher levels than those attainable in wheat. potential and high :est weight in the dwarf plant stature. Triticale is now planted on over 1 million hectares, mostly in developed countries. A number of developing countries are increasing their research attention to this new man-made crop, which can considerably outyield wheat in certain production environments (e.g. those with acid soils and/or cool highland climates). many potential production areas (e.g. hills area of the Himalayas). We are following two approaches to develop earliermaturing varieties. One involves crossing different triticales and selecting for earliness. The other involves finding early, light-insensitive ryes, since the rye parent may be the cause of the relative "lateness",of triticales. Preharvest sprouting is another problem delaying acceptance of triticale in areas where the conditions at harvest time are moist. Improvements in tolerance to preharvest sprouting have recently been made in cooperation with INIA scientists working in the Patzcuaro region of Michoacan, Mexico. Our most promising sources of resistance to sprouting appear to be winter-type triticales, some spring types from Brazil, and some ryes recently developed in northern Europe. within 90 percent of the bread wheat variety Pavon 76.
industry standards for the test weight of triticale-70 kg/hl. identified; selection for resistance should not be a problem. scab, and CIMMYT is initiating crosses with those lines. fungicide application for successful production. We are also using winter-type triticales from programs in Europe and North America in crosses with spring types. These spring x winter crosses have been especially useful in selections for forage-type triticales. Our milling and baking laboratory continues to work closely with the triticale breeding program to improve grain quality in triticale. Significant progress has been made. We now have triticales that approach the quality of wheat on two major characteristics: flour yield and loaf volume. Selection for grain hardness has resulted in a number of triticale strains that approach the hardness of wheat. With these recent improvements we are now making crosses specifically aimed at further improving the industrial quality of triticale. In 1980, seven different triticale nurseries were distributed to collaborators in nearly 100 countries. Two developed countries, Australia and Canada, each released new triticale varieties in 1980 which carried CIMMYTdistributed germplasm in their pedigrees. Four developing countries have also released new varieties in the last two years. human food. Thi, program is conducted in collaboration with ICARDA. After almost eight years of breeding, the barley program at CIM'IYT has entered a new research phase. In its initial stages, program scientists were largely involved in the generation of gErmplasm with high yield potential, wide adaptation, high nutritional quality, lodging resistance, and hull-less grain. Substantial progress has been made in all these research areas. VVhile these previous research areas are not being left aside, A major emphasis is being given to the development of greater disease resistance in CIMMYT's germplasm. objective in the barley program. At present, the hull-less character is spread across 35 percent of our breeding material. High-yielding barley materials for human consumption have been developed by ClMMYT scientists. Our major breeding emphasis is now to increase the disease resistance of these materials. of this material showed that these crosses were far superior in adaptation and yielding ability than straight spring x spring crosses. Early maturity barley lines that are 30 to 40 days earlier to harvest and can yield in the 3.5 to 4.5 t/ha range were again identified in 1980. More extensive multilocational testing of these materials by national collaborators is now under way. These early barleys may prove to be particularly valuable for farmers located in low-moisture or short-season environments. were included in a special crossing block which was distributed in 1980 to scientists in 15 countries. parents within the conventional breeding programs. These efforts in special germplasm development are described below. The protein content in wheat flour ordinarily falls in the range of 10 to 12 percent, reasonably good among cereals. Nevertheless, efforts continued in 1980 to develop bread wheat lines with higher levels of total protein and protein quality. Lines have been identified with high protein levels in their grain (18 to 20 percent) and good agronomic characters. These lines, however, are generally low-yielding and susceptible to many diseases. Crosses were made during 1980 between high protein and high-yielding lines. Some success was achieved in combining both traits into some of the resulting progenies. The staff continued their work to develop high-yielding semidwarf wheat germplasm with tolerance to aluminum toxicity and improved disease resistance. Progress has been achieved in this research area in developing resistant materials in good agronomic backgrounds. The major emphasis now is on increasing the disease resistance and yielding ability of the selections. Work continued in 1980 to improve the rust resistance of bread wheat lines. Various lines from the Agatha x Yecora 70 cross have been identified that are high-yielding and have excellent leaf rust resistance. Our scientists believe that this high level of resistance is due to the pyramiding of two important genes, Lr.9 and Lr.19, which confer to wheat greater resistance to leaf rust. Work is under way to develop solid stem high-yielding durum and bread wheat varieties for areas in North Africa where sawflies are causing yield losses ip normal semidwarf varieties. A tall, late-maturing variety, Fortuna, with a slender solid stem is being used in crosses with high-yielding, earliermaturing semidwarf varieties. Progenies are now available which combine the solid stem character into high-yielding materials. dwarfism, greater earliness, and improved seed type. are being made to improve the agronomic and grain characteristics of triti(ale. Some of the wheat lines selected as parents have a Iarger seed size and more acceptable semidwarf stature than materials previously used. New ryes derived from the variety Snoopy are being used that are semidwarf, have greater earliness, and possess larger seed size. the deficient traits still affecting triticale. In the Wheat Program, our wide cross researchers are placing greater emphasis on wheat x Elymus crosses. The objective is to incorporate into wheat the soil, disease, and environmental stress tolerance characteristics of Elym us. Shown above is a partially fertile wheat x Elymus hybrid (left) from this crossing program. Backcrossing to wheat will help to improve the hybrid further, as shown on the right. levels, and resistance to barley yellow dwarf. Agropyron species have geres for rust resistance, salt tolerance, and barley yellow dwarf resistance which could improve the environmental stability of wheat. Agropyron and E/ymus species are also being screened for genes for fusarium and helminthosporium resistance, simultaneously with the development of hybrid combinations. advanced up to BC11 with promising results. (2n=28) are salt tolerant sources based upon their habitat, although the genel:ic mechanism for tolerance has not been identified. Hybrid! ; of A. elongatum with durum and bread wheat varieties have been made and will be analyzed for tolerance response after single alien chromosomes have been added to wheat. .1. distichum has been hybridized by Dr.
Pienaar (South Africa) with durum and bread wheat. as part of a germplasm exchange agreement. We will continue our efforts to introduce other commercial wheat germplasm into the advanced BC progenies, to develop 'addition' lines, and to test for salt tolerance. The Milling and Baking Laboratory evaluates the grain of bread wheat, durum wheat, triticale, and barley lines for the suitability in making bread, tortillas, chapatis, cookies, spaghetti, and other products. In 1980, the gluten strength was evaluated in thousands of early-generation bread wheat lines previously selected on the basis of good grain type. The early screening for grain type results in few advanced lines with low test weight. As a standard procedure, advanced materials were evaluated for test weight, milling qualities, protein percentage, gluten strength, and baking qualities. The grain of several thousand durum lines was evaluated for pigment (carotenoids) content. Today, most of CIMMYT's advanced lines compare favorably in carotene content with the best American macaroni durums. In the advanced triticale lines, average flour yield is now about 68 percent, with some lines reaching 73 percent (good bread wheats have flour yields of 70 percent). Some triticale lines are showing good bread- and chappati-making qualities; many triticales provide flour that is actually superior for making cookies. Some hull-less barley lines have been identified that make suitable flour which can be used in 20 percent mixtures with wheat flour to make acceptable bread. There are about 40 species of fungi, bacteria, and viruses that are parasitic to wheat, barley, and triticale. These pathogens are responsible for diseases which can cause major reductions in yield among the small grains. through the international screening nurseries. Special stucies are conducted in Mexico on wheat leaf rust and stem ruit using two independent approaches. First, lines which carry a single resistant gene to leaf rust or to stem rust are planted where CIMMYT nurseries are grown. Natural rust infections ire allowed to gauge the environmental ceiling for infection. In the second approach, rust derived from field samp es is inoculated onto appropriate sets of lines in the seedling stage to monitor changes in different virulent types of leaf and stem rust. The objective of these studies is to continuously monitor changes in prevailing races of rust for possible mutations which would lead to new disease outbreaks to which CIMMYT lines might be susceptible. support from the headquarters-based staff. Increased collaboration and consultation in production agronomy research are expanding program activities at ClMMYT. Given the area-specific nature of most agronomic problems, the majority of CIMMYT's production research activities are carried out under regional program auspices. courses. A second function is in the development of weed control, fertilizer, and irrigation recommendations for the CIMMYT nurseries grown at the major stations used in Mexico. Third, research is carried out on some agronomic problems that are not entirely site-specific allowing results of work done in Mexico to be applied elsewhere. A successful in-service training program was continued in the Yaqui Valley, Sonora, Mexico, for agronomists from irrigated areas. The course included agronomic trials on the CIANO experiment station as well as on farmers' fields. CIMMYT wheat agronomists also assisted in the rainfed wheat production agronomy course which is carried out mainly on farmers' fields in the high plateau areas around El Batan in the summer season (May to November). trials have been conducted to determine the interaction of this nutrient wil h different varieties. With no nitrogen applied, and at low levels of application, the tall, medium tall, and semidwarf varieties had very similar yields. In some cases, the newer semidwarf varieties were slightly superior to the tall varieties. As nitrogen was increased, the yield advantage of the newer semidwarfs became much more apparent. oats). The trial is scheduled to run for four years. Bread wheat, durum, triticale and barley nurseries distributed by the international nurseries program in 1980. Mozambique 4 2 1 Hungary 4 4 4 -Niger 1 1 Ireland 2 ..-. .
CIMMYT are the international screening and yield nurseries. are grown in double rows for observation and evaluation. a wide range of climatic and disease conditions. Origin of Wheat In-Service Trainees, 1966-80.
practices in the high plateau area where the trainees are working. CIMMYT received 43 scientists in 1980 who came to visit the wheat program during the winter season in Sonora, Mexico; 10 other visiting scientists visited the El Batan headquarters and Toluca during the summer season. Their main purposes were to collect germplasm, to discuss various improvement problems, and to discuss strategies for accelerating wheat production around the world. The People's Republic of China also sent four participants as part of an ongoing program of scientific exchange. USA) are serving on the Wheat Program staff. Most of CIMMYT's wheat staff posted outside Mexico were assigned to regional programs. Only one staff member was working in a national program assignment-in Pakistan. His work focused mainly on production agronomy research. In 1980, three staff members assumed new regional responsibilities in North and West Africa, in South and Southeast Asia, and in cooperation with ICARDA. In total, the wheat program had staff assigned to seven regional programs in 1980. A Dutch associate scientist is assigned to these regions. and identification of disease resistant lines. the use of two w dely distributed nurseries to gather information and monitcr disease situations throughout the region. (and identification) of promising disease-resistant lines. Turkey as an associate staff member in the program. in the north to Lesotho in the south. The small grains currently grown in 1his region are mostly in the highland areas above 1,700 meters altitude, an agroclimatic zone characterized by the heav\ presence of serious disease problems. The CIMMYT regional staff assigned to this region helps to operate an off-seaison nursery program at Kenya's National Plant Breeding Station at Njoro, 2,140 meters above sea level. In 1980 a pathologist assigned by the Dutch government to Kenya continued to collaborate with the CIMMYT regional program as a staff associate. In addition, the pathologists assigned to the regional disease surveillance program spent some time in this region to help backstop the pathology work of national collaborators. Two nurseries are prepared and distributed by the staff assigned to this regional program: the African Cooperative Wheat Yield Trial (ACWYT); and the Screening Nursery for the African Cooperative Wheat Yield Trial (SNACWYT). Due to shortage of seed resulting from a drought in 1979, only 14 sets of the 4th ACWYT were sent during 1980 to cooperators in 10 countries. Included in this ACWYT were 11 wheat varieties, 2 triticales, 2 durums, plus one check. The highest yielding entries were the two triticale lines, Triticale 65 and Beaver-Armadillo. This confirms the results of earlier regional trials, where triticales have dominated the yield rankings. The 3rd SNACWYT, consisting of 111 bread wheat, 54 triticale, 33 durum, and 10 oat lines, was distributed in 1980 to collaborators in 19 countries for testing in 22 locations. Lines from spring x winter crosses showed superior disease resistance and very high yield performance in the highland areas where this nursery was grown. CIMMYT has had a wheat scientist assigned to this region since 1976 to work with the national program scientists in the five Andean countries. The staff member is based in Quito, Ecuador, under an agreement with INIAP, Ecuador's National Agricultural Research Institute. Virulent forms of stripe rust and barley yellow dwarf virus make this area of considerable value in global screening efforts to develop lines with greater resistance to these disease problems. Two regional nurseries were prepared and distributed by the Andean regional program from its operations base in Ecuador in 1980. These are the Latin American Wheat Disease and Observation Nursery (VEOLA) and the Latin American Rust Nursery (ELAR). the RDISN and 8NACWYT regional nurseries. RDTN, is to survey virulence patterns of wheat pathogens, thus serving as an early-warning system for new mutations. and is distributec' to about 30 sites in Latin America. on-farm research activities within the region. rots. These research activities are receiving a major priority. region organized by IICA-BID Cono Sur Project, CIMMYT was asked to coordinate a screening nursery of advanced lines (LACOS) to be distributed within the region and seeded at key locations in the Andean region and Mexico. in national wheat improvement programs or released as commercial varieties. Several Southern Cone rust virulence nurseries were merged with ELAR to coordinate the effort between the two regions. A special emphasis is also being placed on soil-fertilizer problems related to wheat, barley, and triticale production. In particular, the problems associated with aluminum toxicity and phosphorus fixation tendencies are receiving major research attention. The regional agronomist is working with national scientists to establish trials in farmers' fields for the purpose of identifying yield constraints and increasing production. In Chile, collaboration is focused on production trials conducted mainly on farmers' fields to identify the limiting technical factors in wheat production. Work on management techniques to reduce the incidence of root diseases is also receiving attention. Scientists are also looking at the effect on foot rot problems when various soil amendments are applied. In Argentina, work focuses on soil fertility management strategies brought on by new double-cropping patterns which have emerged with the release of short-season varieties which allow greater cropping intensification. Trials are being carried out in the Pergamino area to investigate nitrogen and phosphorus deficiencies. The trials show that phosphorus deficiency is becoming a widespread problem in the Pampa Humeda. Nitrogen response studies are showing a significant response to nitrogen in the Marcos Juarez area, where most farmers still do not apply nitrogen to wheat. This program began operation in 1980 and covers North and West African countries west of Egypt and Sudan. The operations base is in Portugal at the Elvas Station of the Ministry of Agriculture. At present, one wheat breeder is assigned to the program. Close collaboration exists with ICARDA, and joint staffing may occur in future years. Special breeding priorities include disease resistance research on septoria, fusarium, helminthosporium, and the three rusts. In addition, breeding work will be carried out to develop wheat and barley cultivars with greater drought and heat tolerance. in the Middle Eat and in parts of North Africa. available in mid 1 )81 and a French version somewhat later. we see the possibi ity for more innovations in 1981.
foster exchange and understanding among the planners, biological scientists, and economists of national programs. C IMMYT's economics staff has worked with scientists in many national programs to develop a set of procedures which offer cost-effective ways to assess the circumstances of farmers, and then to use this information to orient research aimed at developing improved technologies. A manual based on that experience, and published in 1980, focuses on research that is area-specific, collaborative (involving biological scientists and economists), and on-farm. The procedures are now being used in many national programs, in CIMMYT and other training programs, and as a central theme in workshops related to on-farm research. One such workshop was sponsored by CIMMYT and involved Latin American participants concerned with on-farm research. Another workshop brought together economists and biological scientists from international centers and national programs to exchange experiences in on-farm research. Efforts to improve and expand the procedures will be multiplied as more and more national programs use them to guide research. We see the procedures as an important element in bridging the gap separating researchers from farmers and from extension workers. Work continued in 1980 to develop methods for facilitating exchange among biological scientists and policy makers. Experience with the management seminars reinforced the conviction that such communication is often weak and fragmented, limiting the efforts of those concerned with developing and diffusing improved technologies. All too often, biological scientists are insensitive to the issues which influence policy makers while those who frame and implement policy are unware of the opportunities through biology. dures for gather ng, analyzing, and presenting such information. With more certain access to wider ranging information, biological scient sts and policy makers can better reinforce the efforts of ea( h to develop and diffuse improved technologies. teams, and prepares materials of special interest. Yaqui Valley of northwest Mexico. Bolivia and in Zambia by CIMMYT's regional economists. The Economics Program training course for agricultural economists and others who work with nati onal maize and wheat production teams has proven to be a very popular addition to CIMMYT's total training program. Course participants concentrate on the concepts and procedures involved in on-farm surveys, working closely with biological scientists as they gain experience in ascertaining and analyzing farmer circumstances. version of the course which can be given as a national inservice training ac.'tivity. Program in 1980. An anthropologist working in Ecuador since 1978 has concentrated his efforts on ways in which our on-farm informal ion-gathering techniques can be improved. He is also assessing the need to incorporate information on diets into the design of research on agricultural techniques. Another, a predoctoral fellow, is working with the Eastern African regional program, helping to train agricultural researchers in on-f~irm research methodologies. A third, also an anthropologist, will move to Haiti in 1981 to help refine our current methodologies and to collaborate with Haitian researchers in on-farm research. UNDP, worked regularly with the national research programs in Kenya, Tanzania, Malawi, Zambia, and Zimbabwe during 1980. He provided assistance in planning on-farm research programs in Malawi, Botswana, Sudan, and Ethiopia. Interest in the research procedures described earlier continued to grow in the region, extending to central and southern African countries. Surveys were undertaken, workshops held, and training given. A Management Seminar for Policy Maker-s was held in Kenya in May 1980, with participants drawn from six countries of the region. A concepts and strategies evaluation workshop, related to developing national on-farm research programs, was also held in May 1980 for senior scientists from the region. Two training workshops, for young professionals in farm economics and agronomy, were also held in Kenya during April and September of 1980. Started originally for Kenyan professionals, these workshops have taken on an increasingly regional flavor. Participants from ten African countries are expected for the April workshop in 1981. An economist was posted to the Andean region in late 1977 for cooperative research work in Colombia, Ecuador, Peru, and Bolivia. This work has concentrated on floury maize, a dominant crop in the highlands; on wheat and barley, secondary crops in highland farming systems; and on tropical maize in the coastal regions. Within the region, two cou ntries- Ecuador and Peruhave made a strong national commitment on-farm research. CIMMYT economists support these efforts through cooperative work to develop and refine research procedures and through training assistance. As well, Bolivia has moved strongly into such research, especially on wheat. Wheat was also added to the on-farm research focus in Peruvian irrigated areas in 1980. This effort is supported by special project funding from CIDA, Canada. with Honduran researchers. Here, again, the work started with assessing former circumstances. National researchers expect to proceed straight through to the formulation of recommendation.. It is hoped that the work can serve as a model for technology development in much of the country. support of the m~ize program's regional agronomist. On a trial basis, the experiment station training program was conducted at the CIANO Station at Ciudad Obregon. move this prograrr back to El Batan. handled than in previous years. Overseas consultation continued. A total of 93 days was spent by the experiment station staff in consulting with collaborators in five countries. A paper was also presented at the 5th International Conference on the Mechanization ofField Experiments held in Wageningen, Holland. During 1980, more than 21,000 grain samples of maize, barley, triticale, and wheat were analyzed for total protein and for th levels of certain limiting amino acids such as lysine and tryptophan. Eighty-five percent of these analyses were done on quality protein maize samples to help breeders guide their improvement research. Most quality protein materials were analyzed for endosperm tryptophan content. A much more selected number (1 in 200) was also analyzed for lysine content, and an even more select group, for all 18 amino acids contained in the whole maize kernel. Protein quality indexes, good indicators of lysine content, were also obtained for about 2,000 of the maize quality protein samples. Work continued on oil content in two maize populations, Temperate x Tropical H.E.o2 (dent) and White H.E.o2 (dent). The objective of this research is to achieve an increase in oil content (energy) in quality protein materials without adversely affecting other yield and protein quality characters. work helps to guide ongoing improvement work. protein materials developed at CIMMYT. out by the National Institute of Animal Sciences in Denmark on CIMMYT's most promising quality protein materials (3 in maize, 2 in triticile, and 2 in barley). These animal-feeding trials confirm the nutritional superiority of the materials identified at the CI MMYT laboratory using chemical analyses. ability to take up :hosphorus in acid soils. A new laboratory procedure to screen wheat seedlings for their tolerance to aluminum toxicity is helping to speed up the work of breeders to develop high-yielding, aluminum tolerant varieties. Tolerant materials identified in the laboratory showed a good correlation with selections made under field conditions. were evaluated with this method. Tolerant materials identified in the laboratory showed a good correlation with selections made in the field. In 1980, three scientists, from the national quality protein laboratories in Ecuador, Guatemala, and Turkey, received training at CIMMYT in chemical protein evaluations. Consultation services in several collaborating countries in protein quality laboratory procedures, staffing, and equipment requirements were also continued. experiments conducted by CIMMYT scientists. issuing them under national imprimaturs. Kingdom) issued on behalf of CIMMYT Volume 6 of the Maize Quality Protein Abstracts (MQPA) and Volume 6 of the Triticale Ab! ;tracts (TA). About 650 maize scientists receive the MQPA, and about 400 scientists receive the TA. presented to CIMMYT management in early 1981.
de Maiz y Trigo, A. C.
Tl IN I . . . .